Please note the videos will not play on Apple computer Power PC models. Cerritos TV3 is the City's government access cable channel, which is cablecast to Cerritos homes through the Charter Communications and Frontier FiOS cable systems. Cerritos TV3 provides live coverage of Cerritos City Council meetings, Planning Commission, Fine Arts and Historical Commission, Property Preservation Commission, Parks and Recreation Commission and Economic Development Commission meetings. Cerritos TV3 also presents a variety of entertaining and educational videos and a community bulletin board. To enhance the community's access to information, the City of Cerritos offers meeting videos and a live stream of Cerritos TV3 through its web site. To access these services, you must first download a free Microsoft Silverlight Media Player. Click on the "Get Microsoft Silverlight" button at the bottom of the page for more details and instructions. This website offers an archive of City Council and Commission meetings that held from January 21, 2003 to the present. Meeting videos are typically available 24 hours after the conclusion of the meeting. You can search for a topic by key word, or select a meeting based on its date. 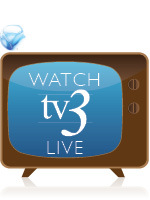 Informational programs produced for Cerritos TV3 are also available in the TV3 video archive. Cerritos TV3 cablecasts announcements on the activities, meetings and services of Cerritos registered A and B organizations that have approved rosters and by-laws. 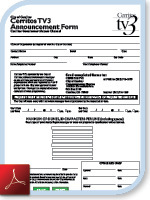 Eligible community groups can fill out a Cerritos TV3 Announcement Form above. For questions about Cerritos TV3, call the City's Communications Division at (562) 916-1320.